Do you enjoy going to work? Are you happy with the position of respect and love that you hold among your colleagues? Well, while some may say yes to these questions others may choose not to answer or worse, say no. 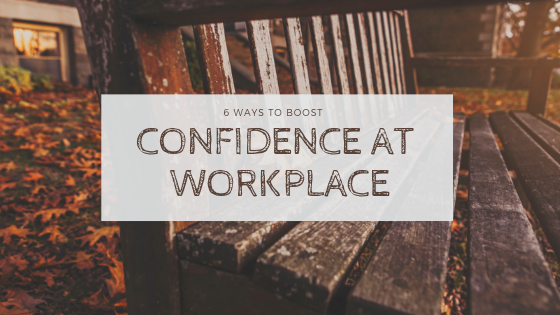 In order to hold a position of respect at your workplace, your level of confidence must be optimum. But again this is easier said than done, especially when you are going through some nerve popping issues in the office. Such issues involve asking your boss for an appraisal, sharing your ideas with the new team members, bringing an important issue to the management’s notice, and such. When faced with any of these stances, your self-esteem might receive a severe blow. But if you wish to have a noteworthy reputation in office, then a slight amount of confidence on your part is highly required. Thinking about how to boost it? We have a few tips right here! You must be aware of your inner voice, and the abrupt chiming it does in the most inappropriate moments. Such comments made by your inner voice is most likely to make you feel absolutely worthless at times. Very rarely does this inner voice say something meaningful. If you have interacted with your inner voice, you perhaps know how insensitive and difficult it is to deal with it. It is almost like the mean girl in the cafeteria making snide comments about your clothes and hammering your confidence level to dust. It’s true that it’s almost impossible to shut down the voice altogether at times. But you need to control it. The process can only begin when you start recognizing your inner voice and its constant negative chattering. It is then can you nip it in the bud. Tweak the way you are thinking, and convince your inner voice that it’s not yet your time. Honestly, criticisms can be hard to hear. It is a constant reminder of the fact that you are not flawless. The worst part is that it shatters any form of courage you have managed to muster. Zooming on to constructive criticism, however, will not help you improve constantly, but it can create a protective shield around your self-confidence. Instead of thinking “he/she has come to demean my work, God, they hate me”, think something like “ The person is trying to help me out and has spent some good amount of time going through my work and is trying to help me grow”. If a person is indeed spending so much time on you, then it is okay to conclude that you do hold a position of importance. Do not be too busy checking things off your checklist. At times, take a step back and celebrate all that you have achieved. Give yourself that much-required pat on the back! Though initially, you may find this a bit awkward, by celebrating your success you end up reminding yourself your self-worth and that is a confidence booster. Get your Boss to stroke your ego? Oh no, that’s not what this is about! Building a better relationship with your boss gives you the chance to have a strong advocate in your nook. When your boss is aware of what you are working on, how you are growing, the time you have invested in a project, you will have someone to score you a home run when absolutely required. In moments of absolute distress, it is always advisable to return to the things you are skilled and good at. While your entire career cannot be a bed of roses, all hunky dory, at times coming back to things you excel in, provides a good backing. Such tasks remind you that you are not completely worthless, and there are a few important skills and knowledge that you possess. Keeping your feelings bottled up will only build pressure within you. Thus it is sometimes helpful to share your concern and fear with other people. Though it may seem scary to begin with, you will realize, that some people around you are helpful. Once they know how much effort you are putting in, chances are, they will become your greatest cheerleaders at your workplace! You can try the same too. Start working on it today to get the best results.